The budget announced by the government on Monday for fiscal year 2015-16 – Rs488 billion – is 17% higher than the ongoing year’s outlay of Rs404 billion. PESHAWAR: The participants of a public hearing on problems and issues in the education, health, water and sanitation sectors on Tuesday put forward suggestions for improving the situation and making the government departments more accessible to the public. 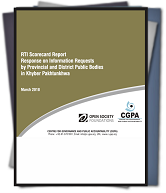 PESHAWAR: The Centre for Governance and Public Accountability (CGPA) on Tuesday said that a scorecard it had prepared revealed poor implementation of the Khyber Pakhtunkhwa Right to Information (RTI) law by different departments. KP government is alert to the education needs of the province. The government has imposed education emergency and it should be gauged by the increases in education budget that is unprecedented in the history of the province. PESHAWAR: The Khyber Pakhtunkhwa government allocated Rs 4.3 billion to Peshawar, Nowshera, Mardan, Swabi and Swat district out of Rs8.5 billion development funds doled out to the lawmakers from across the province during the last fiscal year, 2014-15, show documents obtained by the Centre for Governance and Public Accountability (CGPA). PESHAWAR – The parliamentarians and intelligentsia extended full support to the passage of the proposed 22nd Amendment from the parliament allowing merging of the Federally Administrated Tribal Areas (FATA) into Pakthunkhwa province and amendments in the FCR.